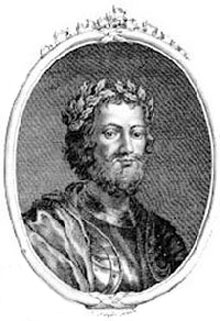 Kenneth II, son of Malcolm I, king of Alban, succeeded Cuilean, son of Indulph, who had been slain by the Britons of Strathclyde in 971 in Lothian. Kenneth began his reign by ravaging the British kingdom, but he lost a large part of his force on the river Cornag. Soon afterwards he attacked Eadulf, earl of the northern half of Northumbria, and ravaged the whole of his territory. He fortified the fords of the Forth as a defense against the Britons and again invaded Northumbria, carrying off the earl's son. About this time he gave the city of Brechin to the church. In 977 he is said to have slain Amlaiph or Olaf, son of Indulph, king of Alban, perhaps a rival claimant to the throne. According to the English chroniclers, Kenneth paid homage to King Edgar for the cession of Lothian, but these statements are probably due to the controversy as to the position of Scotland. The mormaers, or chiefs, of Kenneth were engaged throughout his reign in a contest with Sigurd the Norwegian, earl of Orkney, for the possession of Caithness and the northern district of Scotland as far south as the Spey. In this struggle the Scots attained no permanent success. In 995 Kenneth, whose strength like that of the other kings of his branch of the house of Kenneth MacAlpin lay chiefly north of the Tay, was slain treacherously by his own subjects, according to the later chroniclers at Fettercairn in the Mearns through an intrigue of Einvela, daughter of the earl of Angus. He was buried at Iona.